True Love (Slot Game) was released in October 2009 by Playtech. This game has set of 5 reels and 15 paylines. The visuals of the game feature quality graphics with bright color combination and art style. The game is based on the theme of Love. 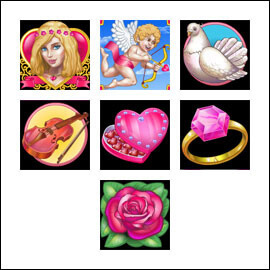 The symbols on the reels are Cupid, White Dove, Violin, Rose, Ring, Chocolate and all other high value card symbols ranging from Ace to number 9.In the background game has intimidating soundtrack complementing the game theme. The highlight of the game is the True Love Free Spin Bonus. The game has 5 reels and 15 paylines. The coin size varies in the denominations of 0.01 up to 5.00 per line bet, and wagers 1 to 10 coins per line bet. The minimum bet amount is 0.01 and the maximum bet amount is 750.00 per spin. The Jackpot Payout is of 10,000 credits per bet line. The game features Scatter symbol, Wild symbols, True Love Free Spin Bonus feature and True Love Gamble Feature. The Cupid symbol in the game is a wild symbol. This means that the Cupid wild symbol acts as a substitute for all other symbols except the scatter symbol to complete winning combinations. Multiple wild symbols also create their own winning combinations. During this gameplay, the Cupid wild symbol "doubles" the payout of any winning combination when acts as a substitute. The winning combination payout of Cupid Symbol is not gets doubled during the gameplay. The True Love symbol in the game is the scatter symbol. This means that the True Love symbol does not need to appear in a line, on an enabled payline to win. The True Love scatter symbol can be scattered anywhere on the five reels to complete winning combinations, provided two or more scatter symbols appear. Winning during this gameplay are calculated by multiplying the True Love symbol combination payout. This game is triggered when three or more True Love scatter symbols scattered anywhere on the five reels activates the True Love Free Spin Bonus game. During this feature players are awarded 15 Free Spins; all winning combinations during the Free Spin games are tripled. This game can be re triggered. All the bets and paylines played during the True Love Free Spin Bonus game will remain same and all control over the buttons will get disabled. Any winning during the True Love free spin bonus game will activate this gamble feature game. Here, player will get a chance to gamble all winnings. Provided the win will not exceed the gamble limit when gambled. Any correct guessing of the card color will enable the player to double the winning.